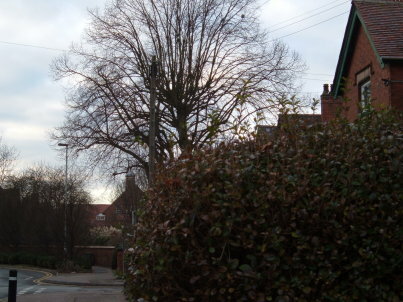 Strange lights have been seen over Tamworth Staffordshire during August and September 2007. SOME spooky goings on have been spotted in Tamworth's night skies. Reports of UFO activity have been followed by sightings of a supposed meteorite landing close to No Man's Heath. Civic Society president Joyce Smith was witness to the UFO sighting in the early hours of Thursday morning (August2). She was dozing in her Hospital Street home when she became aware of a load humming noise at around 3am. Believing it to be a helicopter she opened the curtains but descibed being blinded by a huge saucer-shaped light hovering towards the house. "I couldn't work out what the devil it was," said Mrs Smith. "It was very bright with a blue coloured halo around it." "It lit the whole area up for quite a while. It wasn't moving quickly, more like hovering." The light travelled from the direction of Leyfields, floating over the railway line and across the fields behind Moorgate Primary School. As it drew closer to Hospital Street Mrs Smith became more concerned. "I shut the curtains quickly. It was quite scary," she said. "There was certainly something strange happening." No Mans Heath resident Peter Stockton had an equally unexpected experience on Sunday night (August 5). He told the Herald he was enjoying a rare balmy evening on the patio of his Austrey Lane home when a ball of light streaked across the sky about 100 feet above the ground. He said: "It went behind some trees in my garden and I lost sight of it." 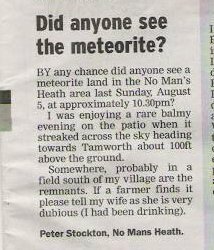 "It appeared to go towards Tamworth so I assume it must have landed somewhere in the town." "It was over in 10 to 15 seconds and there was no noise." "If a farmer finds it please tell my wife as she is very dubious." Mid-August is regarded by stargazers as meteorite season as the nights get dark enough for Britons to appreciate them. A 'SPACE-AGE' mystery that has been baffling people at Two Gates was finally solved this week. Residents had been puzzled by the mysterious appearance of a giant yellow patch of ground on land opposite Bright Crescent. The Yellow area - about 60ft long - appeared to come from nowhere in the middle of the night. And at least one resident believed a UFO may have caused it. The suggestion of 'extra-terrestrial' activity came from Christopher Hare from Bright Crescent. He linked the appearance of the patch with an alleged flying saucer sighting by a Two Gates woman just a few days before. Even the police could shed no light on the origin of the patch. But this week a council official confirmed that the yellow area has nothing to do with UFOs, ET or Martians. It was caused by weedkiller. The great patch mystery was explained away by parks superintedent Mr Len Appleyard. "The area of land in question needed to have all the grass killed in preparation for new trees," he said. "We sparayed some herbicide on the area but I suppose what confused people is that the patch appeared a while after the spraying, so it must have seemed to have come from nowhere," he said. The patch had fascinated Christopher Hare since he discovered it one frosty morning. "I saw the patch for the first time when I took the dog for a walk. The night before I had not noticed anything and it seemed really curious." "I knew it would not have been a tent or a marquee because the night it appeared was one of freezing fog. I sked poeple in the area if they had seen anything like it before and they hadn't, so it all seemed rather starnge." A few days after spotting the patch, Mr Hare heard that Mrs Gladys Smith, from Parkfield Crescent, had claimed she had seen a flying saucer pass over the roof of her house. And even if the yellow patch mystery has reached a rsther unexciting conclusion, the same cannot be said for Mrs Smith's claim that she saw a saucer. Her sighting came in the early hours of the morning. She had been finding it difficult to sleep, so she got out of bed and moved towards the window. Outside she saw something which left her stunned and speechless. "I saw in the distance what appeared to be a very low-flying plane coming towards me from the Birmingham area. The closer it came, the more I realised that it could not have been a plane. Ther were red and white lights all round and it had a very strange shape," said Mrs Smith. Although she only saw the object for a matter of seconds, Mrs Smith is convinced it was a saucer. "At first I never told anyone because I was convinced people would think I was barmy, but I know what I saw," said Mrs Smith.